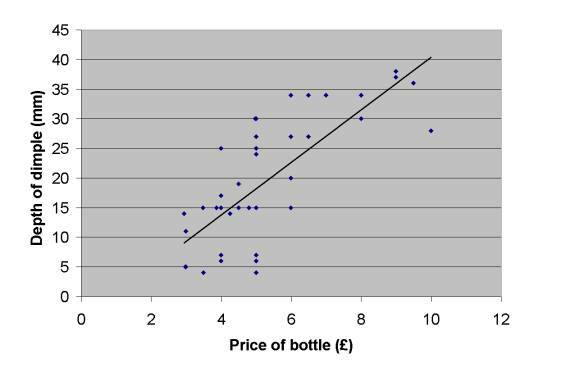 When friends argued that the depth of the dimple on the bottom of a wine bottle had no relation to its price, UK scientist Dr. Karl Blanks, a graduate of Cambridge, decided to do some research. He turned first to the Internet, which not only failed to back him up, it sometimes described the notion as urban myth. Fellow scientists across the globe checked it out, and confirmed the validity of his results. You can even check out his graph. If I'm not mistaken, it's called a "punt". There are many different theories on its purpose (see: http://pweb.netcom.com/~lachenm/puntFAQ.html). I tend to believe, as many enthusiasts do, the deeper the punt, the more surface area the wine is exposed to, and wine that is designed to age is of higher quality and therefor will have deeper "dimples" to allow for more surface area for aging. So it makes perfect sense that higher-quality wines will have bigger dimples. It's a sign of the wine's ageworthiness.